"Build the timeline YOU want!" TimelineBuilder for iPad is a unique and robust app that allows the user to create custom timelines with beginning and ending dates of their choosing, adding events where they want with the ability to manipulate image size and placement. TimelineBuilder is a flexible tool, allowing the user to edit timelines; add, edit and delete events; add or swap images; resize and reposition images and timeline events. 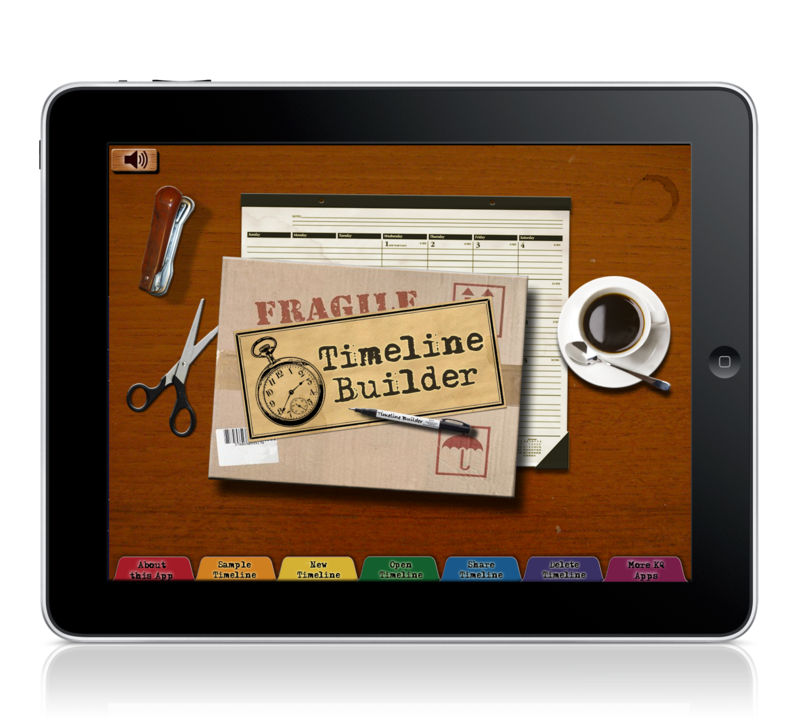 TimelineBuilder is ideal for children, teens and families studying any time period in history, science or literature. It is ideal for genealogists to record family lines and progression; for project managers, marketers or any other professional that needs to keep a running timeline of events. KQ TimelineBuilder is THE timeline resource tool that will organize and display chronological events the way YOU want to see them. Timeline built in TimelineBuilder are saved automatically and can be shared to your image library or with other users of TimelineBuilder. NOT AVAIL until 11/1/12. We'll need room to add more presidents... we better zoom in! Perhaps we had better zoom in some more. TimelineBuilder lets you zoom up to 16X! We're studying Ancient History, so we can add the events as we study them. Handy Wiki button included for quick fact gathering. We'll definitely want to add more events to this timeline. Just click the "add events" button at the top left. You can also turn the jazzy 1940's era music on and off from the speaker button to the very left. Since this TimelineBuilder tool is so flexible, we can build timelines for virtually anything we want... history, family genealogy, books we love, projects that need to be organized chronologically, etc. TimelineBuilder allows you to build timelines for events that haven't happened yet in the future. This is a great organizational tool as well!